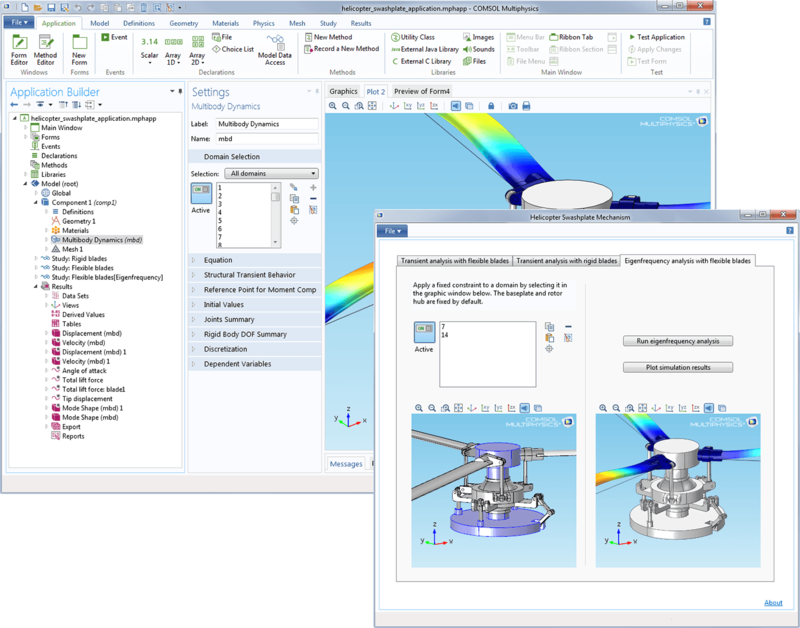 Analysis of the swashplate mechanism to control orientation of helicopter rotor blades. Transient simulation with both rigid and flexible blade designs provides insight into useful performance metrics such as blade deformation and lift force. 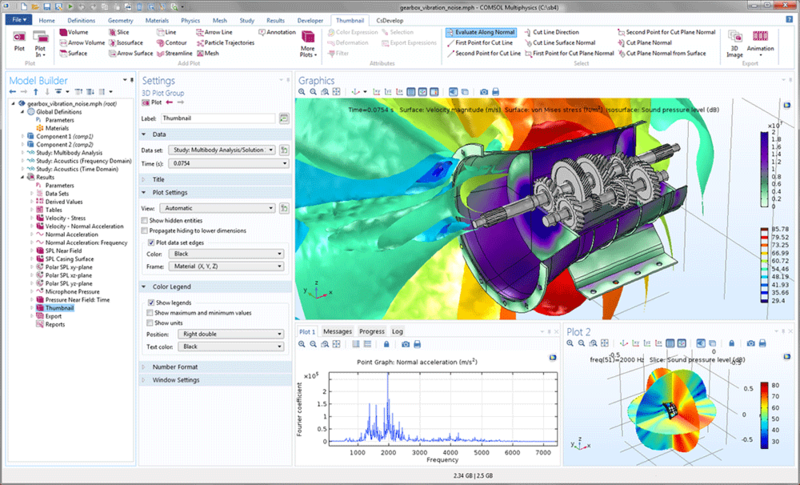 The Multibody Dynamics Module is an expansion of the Structural Mechanics Module that provides an advanced set of tools for designing and optimizing multibody structural mechanics systems using finite element analysis (FEA). The module enables you to simulate mixed systems of flexible and rigid bodies, where each body may be subjected to large rotational or translational displacements. Such analyses help identify critical points in your multibody systems, thus enabling you to perform more detailed component-level structural analyses. The Multibody Dynamics Module also gives you the freedom to analyze forces experienced by segments of the structure, and stresses generated in flexible components that may lead to failure due to large deformation or fatigue. 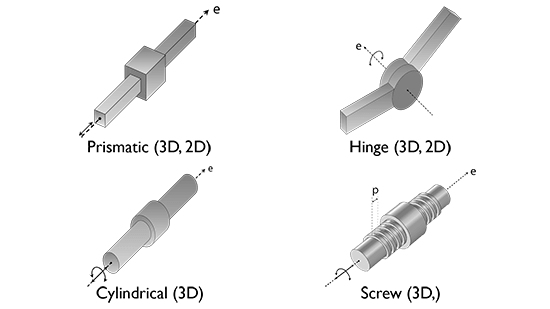 Orientation of movement for the prismatic, hinge, cylindrical, and screw joints. 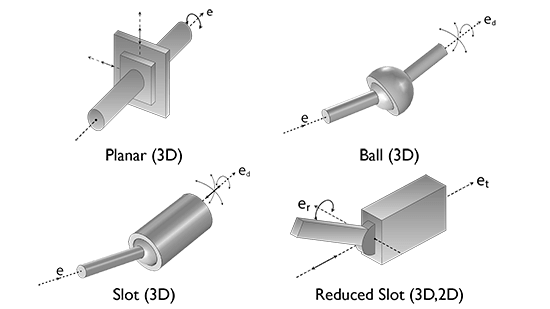 Orientation of movement for the planar, ball, slot, and reduced slot joints. The stresses in the gearbox housing and the sound pressure level in the surrounding air (top and bottom-right) of a 5-speed synchromesh gearbox inside a manual transmission vehicle. The frequency spectrum of the normal acceleration at one of the points on the gearbox is also shown (bottom-left). A swashplate mechanism is used to control the orientation of helicopter rotor blades. 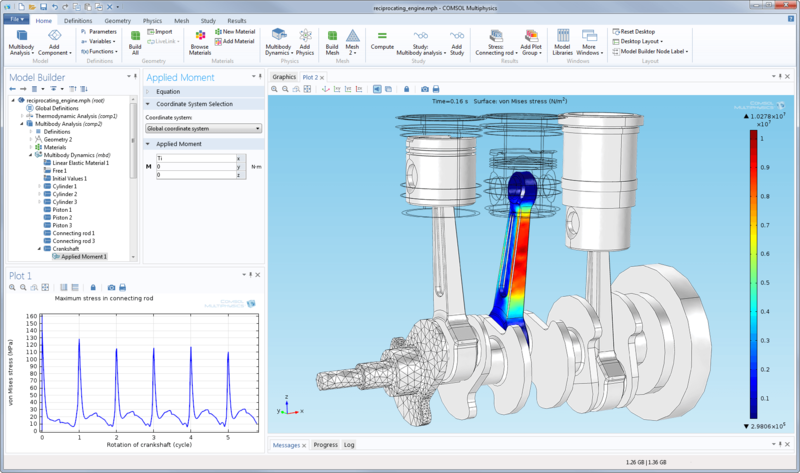 This example shows an application derived from the model where only the pitch of the blades can be changed, but where both transient and eigenfrequency analyses can be presented. Model of a three-cylinder reciprocating engine, having both rigid and flexible parts, is used for maximizing the engine power and the design of structural components. Plot of stresses in an induction motor's housing (top) and the magnetic flux density in the rotor (bottom-left). The rotor orbit at two bearing locations is also shown (bottom-right). Components of a system that undergo deformations can be modeled as flexible, while other components, or even parts of these components, can be specified as rigid. 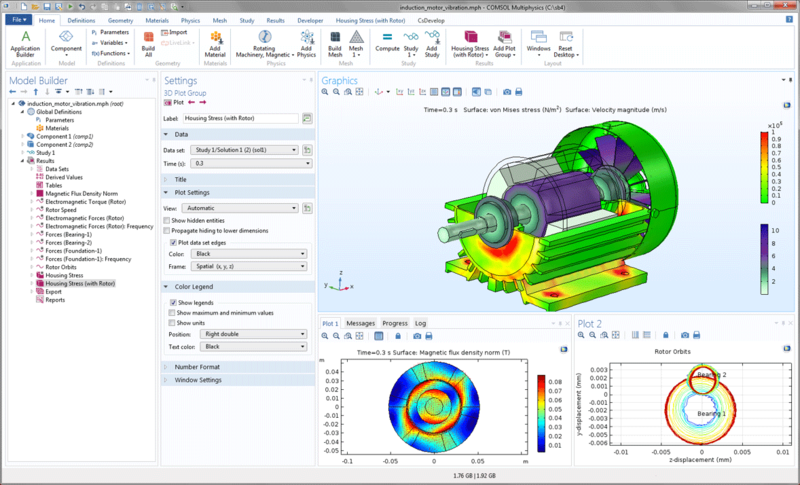 You can also provide your multibody dynamics design and analyses with nonlinear material properties by combining models in the Multibody Dynamics Module with either the Nonlinear Structural Materials Module or the Geomechanics Module. At the same time, the rest of the physics that you can model with COMSOL Multiphysics and the suite of application-specific modules, can be coupled to the physics described by the Multibody Dynamics Module, such as the effects of heat transfer or electrical phenomena. Often, motion between two components is restricted due to the presence or functions of other physical objects. Limiting and conditionally locking the relative motion can be specified for the joints in order to fully define and model these complex systems. In robotics, for example, the relative motion between two arms can be defined as a pre-defined function of time. Joints can also be spring-loaded and appropriate damping factors can be included in the Multibody Dynamics Module. Frictional loss to a joint can be added for the joint types: Prismatic, Hinge, Cylindrical, Screw, Planar, and Ball.